Authored by David Halperin of Republic Report & designed by Wake Coulter. The Center for Media and Democracy’s (CMD) Brendan Fischer and Nick Surgey uncovered an internal document from the American Legislative Exchange Council (ALEC) at the controversial organization’s meeting last week in Oklahoma City. 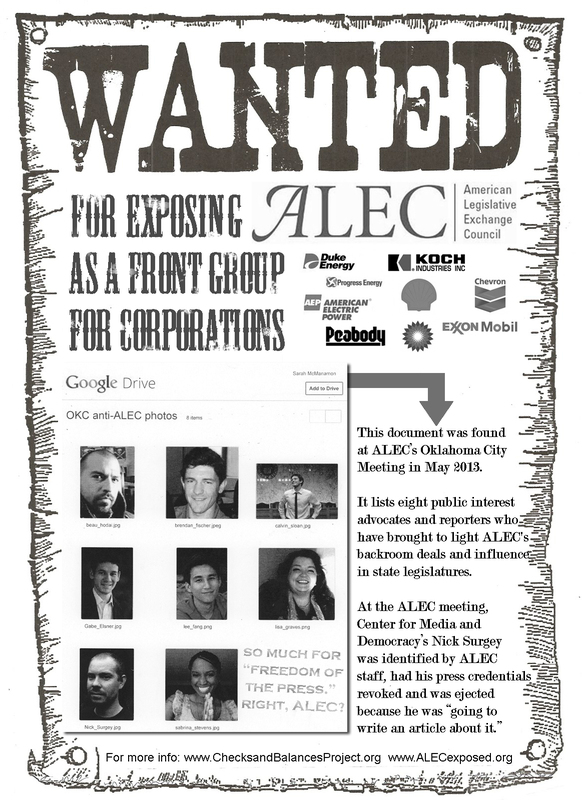 The document entitled “OKC anti-ALEC photos” featured the headshots of eight reporters and public interest advocates that have written about ALEC or been critical of ALEC’s activities (as a front group working on behalf of its corporate membership). CMD’s Surgey attempted to attend the keynote address by Oklahoma Governor Mary Fallin, which was billed as open to the press. After registering for press credentials at the ALEC registration desk, Mr. Surgey ascended the escalator towards the keynote speech, but was confronted by ALEC staff members and then approached by a uniformed Oklahoma City police officer. “I need those credentials,” the officer said. “No, you didn’t,” said a female ALEC staffer, who was accompanying the officer. “I did, downstairs,” he said. The reason Surgey shouldn’t have been allowed to register, according to the ALEC staffer: “Because we know who you are. 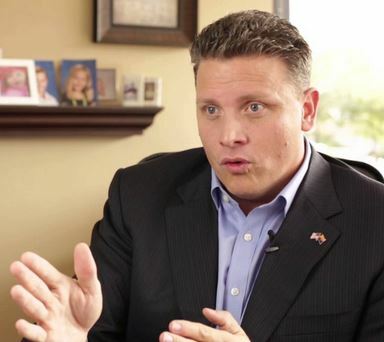 Can I ask your name?” Surgey asked the ALEC staffer who challenged his press credentials. “Yeah, because I know who you are,” she said. The page featured pictures and names of eight people, four of whom work with CMD, including Surgey, CMD’s general counsel Brendan Fischer and its Executive Director Lisa Graves, as well as CMD contributor Beau Hodai. 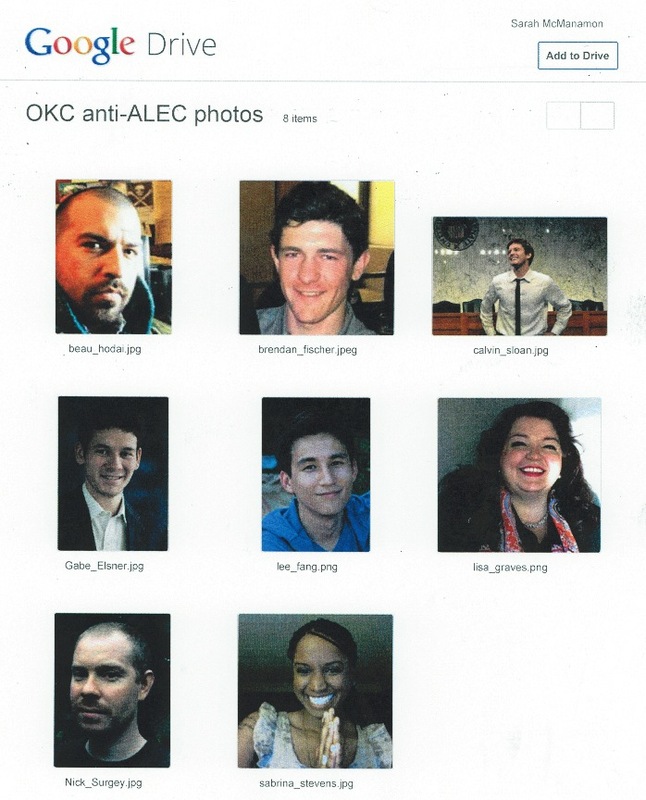 It is not known whether the photo array of people who have reported on or criticized ALEC was distributed to ALEC members or shared with Oklahoma City law enforcement. Other targets on the document included The Nation‘s Lee Fang, who has written articles critical of ALEC, and Sabrina Stevens, an education activist who spoke out in an ALEC task force meeting last November. 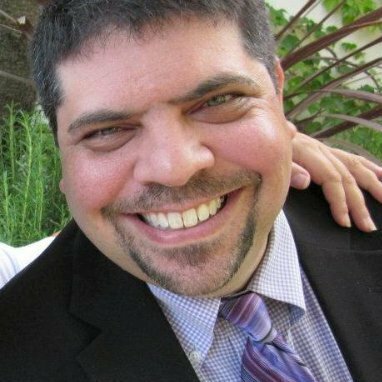 Also featured were Calvin Sloan of People for the American Way and Gabe Elsner of Checks and Balances Project, both of whom are ALEC detractors. The name of ALEC Events Director Sarah McManamon was in the top corner, indicating the document was printed from her Google account. ALEC’s sensitivity to transparency shows that the accountability work by C&BP, CMD, People for the American Way and others is working. A free society can’t work unless there is some check on the concentration of power. Now, more than ever, society needs more of the most powerful check on concentrations of power – public scrutiny. Most recently, C&BP has worked to expose ALEC’s efforts to eliminate clean energy laws in states across the country and bring to light that these attacks are being driven by powerful special interests. ALEC exemplifies how fossil fuel corporations and other special interests have an oversized influence in our public process. And, C&BP is proud to be part of the effort to expose ALEC, fossil fuel-funded front groups and other fossil fuel interests using their power and resources to attack clean energy policies — even if it lands us on ALEC’s Most Wanted list. 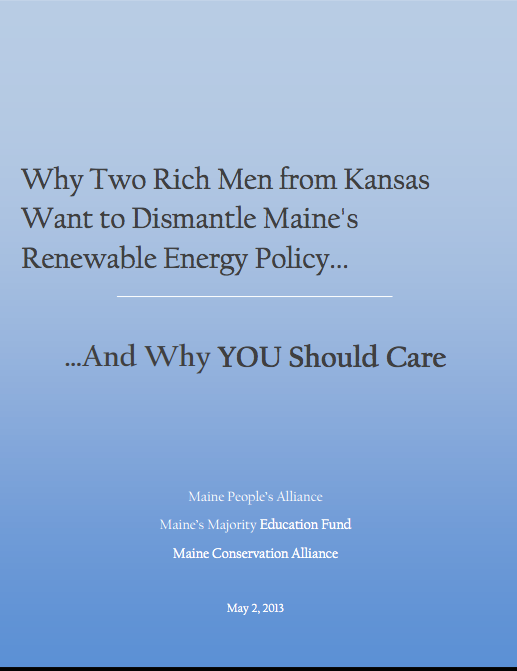 Maine’s renewable energy standards have been the prime target of the Koch Machine – front groups, think tanks, and legislators with financial ties to Koch Industries and its two billionaire owners: the Koch brothers. The Renewable Portfolio Standard, which requires utilities to provide 30% of their energy through renewable sources, has led to $2 billion in investment and over 2500 local jobs. It has proven to be great for Maine’s economy – but it threatens the profit margins of fossil fuel companies like Koch Industries, which pumps 300 million tons of carbon into the atmosphere every year. To dismantle the RPS, the Koch brothers have been extending influence through a legislative front group – the American Legislative Executive Council (ALEC). ALEC has contributed over $750,000 to political action committees, candidates, and parties in Maine. Senator Mike Thibodeau, one of the anti-RPS bill’s co-sponsors, has received over $15,000 from ALEC-affiliated organizations. It is the civic duty of Mainers to decide for themselves what is best for the state’s environment and economy, not an out-of-state corporate interest. The Maine Conservation Alliance affirms that the economy is not for sale. 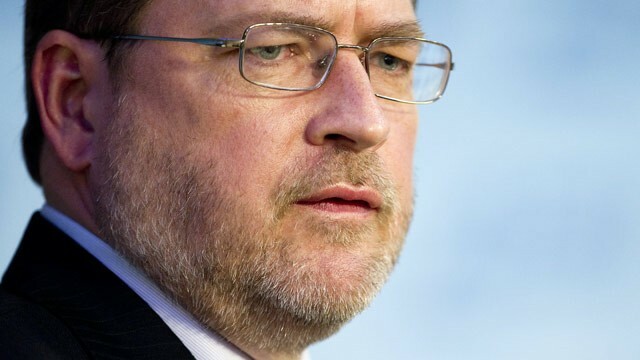 Grover Norquist is a familiar player in Washington debates, renowned for convincing nearly every Republican in Congress to sign a pledge to not raise taxes. But Norquist’s main job is not as a principled advocate for his brand of limited government but functioning as a paid lobbyist for whatever corporate interests are ready to write him a check. Norquist is a prominent pundit for Big Pharma and Big Tobacco, and now, he’s also batting for Big Oil. Norquist, President of Americans for Tax Reform (ATR), is at the forefront of the latest fight against renewable energy in the United States. Conservative front groups and fossil fuel interests are attacking renewable energy standards in a coordinated assault to protect profits generated from fossil fuel-based electricity. Twenty-nine states have renewable energy standards and twenty-two of those have become fierce battlegrounds. This coordinated attack on clean energy bears resemblance to the effort by Big Tobacco to prevent public health laws from impacting the profitability of tobacco companies. And it turns out, a lot of people working to dismantle renewable energy laws are deeply connected to Big Tobacco. Some, like Grover Norquist, even worked with Big Tobacco on their misinformation campaigns and are now turning their lobbying power to attack state clean energy policies. The attacks on the Renewable Portfolio Standards (RPS) originated primarily from the American Legislative Exchange Council (ALEC), whose energy task force is comprised of fossil fuel companies and front groups members like ATR. In late February, several ALEC groups including ATR attempted to convince Kansas legislators to weaken their renewable energy law, which would require renewable energy to make up at least 20% of their energy portfolio.Norquist himself testified to the Kansas legislature to roll-back the RPS. 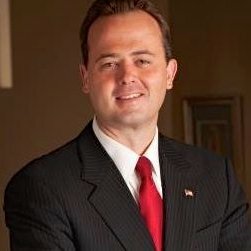 Americans for Tax Reform has received $525,000 from the American Petroleum Institute between 2008 and 2011 and $60,000 from foundations connected to Koch Industries between 2003 and 2011. Fighting against renewable energy in the states isn’t Norquist’s only project working to protect fossil fuel interests. ATR is part of a Tea-Party “last stand” seeking to derail the U.S. Environmental Protection Agency’s effort to regulate carbon dioxide emissions. Last year, Norquist also made a public statement that there was “no conceivable way” he could support a carbon tax aimed at slowing global warming and pollution. Norquist has a track record of defending industries engaged in massive denial of scientific knowledge. The dirty energy industries that fund ATR pretend that the climate change science is inconclusive despite broad scientific consensus. But that approach is not new – it was refined through millions of dollars in lobbying, public relations and front groups by the tobacco industry, which denied the harms caused by smoking. Americans for Tax Reform, run under Norquist, has been a longtime ally of the U.S. tobacco industry and a major player in pro-tobacco tax policies. ATR’s history with Big Tobacco was pulled from hundreds of documents that live in the Tobacco Archives and documented by SourceWatch. In the early 1990s, the government started increasing tobacco regulation via taxes and bans to compensate for the health costs of smoking. Philip Morris President Roy Marden wrote an internal memo calling attention to the need to “regain the upper hand” on public opinion of tobacco. In 1992, RJ Reynolds documented a campaign plan to “move public opinion in the right direction” – in order to weaken tobacco regulation. The following year, ATR’s pro-tobacco campaign began. With the help of focus groups from eight different cities, ATR launched an advertisement in 152 newspapers targeting 51 Members of Congress. Their success was documented by Philip Morris, and used for even further campaigning. Along with coalition support came monetary support. Philip Morris contributed $30,000 to the ATR Foundation in 1994, according to internal documents. The R.J. Reynolds Tobacco Company contributed $100,000 to ATR two years later and ATR received additional money from RJR in 1997 to continue PR support of lobbying activities, one month before Norquist went on the road to speak out against cigarette tax increases. President Bill Clinton announced that “the Justice Department [was] preparing a litigation plan to take the tobacco companies to court, and with the funds [they] recover, to strengthen Medicare” in his 1999 State of the Union Address. Less than one month after Clinton’s speech, Norquist had published a media release and letters to radio show hosts complaining about the litigation – without disclosing his own financial ties to tobacco. Weeks later, Norquist wrote a letter to Kirk Blalock of Philip Morris requesting $200,000 in continued support. Norquist and ATR spent the next few years continuing to campaign against the litigation efforts, writing letters to warn Congressmen of dire consequences. ATR continued to receive monetary support from Philip Morris, but Norquist campaigned for even more money from a coalition of tobacco groups. He sent a proposal to Lorillard and Philip Morris titled “No taxation through litigation – stopping the federal Medicare suit.” The proposal was seeking $582,672. What came of the proposal was undocumented, but ATR has continued to lobby on behalf of the tobacco industry. They organized an anti-tobacco tax rally in 2010, using an email list paid for by Philip Morris. They list several appeals to oppose bills that would raise tobacco taxes on their website, including a 2011 Louisiana bill and an Arkansas House Bill. In early 2012 they campaigned against California’s Proposition 29, another tobacco tax increase. Sacramento Bee editor Dan Morain asked Patrick Gleason, a Norquist aide, whether Americans for Tax Reform still accepted tobacco money, to no response. The lies and deception continue with climate change denial and attacks against renewable energy standards on behalf of the fossil fuel industry. It seems Grover Norquist and Americans for Tax Reform will campaign for anything, for the right price. The Heartland Institute, which receives hundreds of thousands of dollars from the fossil fuel industry, including Koch Industries, rightly came under criticism this week for its secretive role in promulgating anti-climate change science. Sadly, fossil fuel-funded efforts to spread misinformation using benign-sounding front groups don’t stop with climate change. The fossil fuel industry has also used this strategy of third-party front groups to attack clean energy technologies. Just last month the American Enterprise Institute (AEI) released a new series attacking the renewable energy industry. AEI has received at least $11.8 million from the fossil fuel industry, including Koch Industries, according to public IRS 990 forms recently obtained via Media Matters’ Conservative Transparency.